It was a proud day for all at dock10 as Her Majesty the Queen visited Salford to officially open The Studios at MediCityUk. Accompanied by the Duke of Edinburgh, the Queen arrived in the packed piazza to great cheers from the crowds of schoolchildren, locals and employees who turned out to welcome her. BBC director general Mark Thompson, and Peter Salmon, director of BBC North, gave the Queen a tour of the dock10 studios where numerous programmes are made for the BBC. This included the studios for Match of the Day where the Queen watched rehearsals for Football Focus, with presenter Dan Walker demonstrating some of the high-tech visual effects used in the show. The royal couple then visited the suite of studios used for children’s television, including Blue Peter and Newsround. Talking with a number of presenters, the Queen was treated to a specially scripted performance by CBBC characters Hacker T Dog and Dodge T Dog. Moving into dock10’s Philharmonic Studio, the Queen enjoyed performances by the BBC Philharmonic and the Salford Family Orchestra before being called upon to unveil the official plaque. John Whittaker, founder of Peel Holdings who own MediaCityUK, thanked the Queen for coming and congratulated her on her Diamond Jubilee. 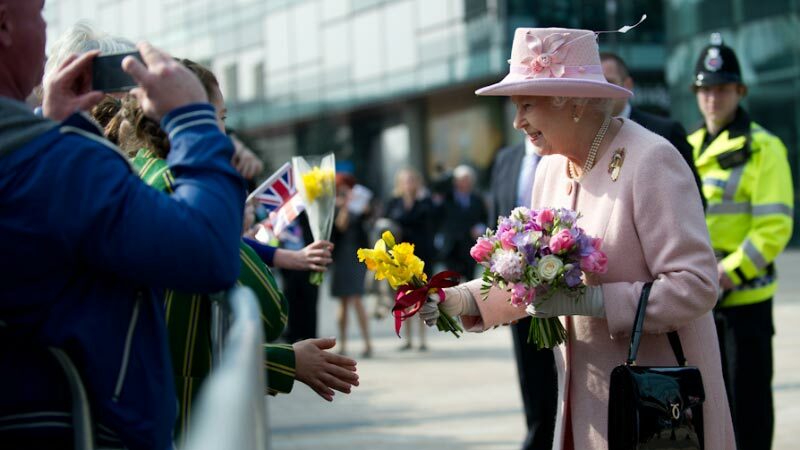 The visit ended with the Queen starting hundreds of runners on a Sport Relief Mile around MediaCityUK.